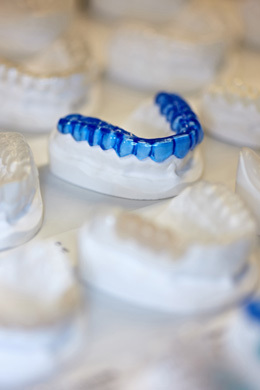 A mouth guard can be called by different names; a splint, night guard, occlusal guard, or sports guard depending on the main reason that it is being recommended to you. Why Get a Mouthguard ? Essentially it is an acrylic appliance that covers the biting surfaces of your teeth. It can be hard or soft, made to cover the top teeth or bottom teeth, but the goal is to prevent the biting surfaces of the teeth from contacting each other. This will prevent grinding or breaking your teeth or dental restorations. It can be prescribed for patients that are known to be bruxers, daily clenchers or night time grinders. Both Drs. Samuel Chiu and Sukhmani Singh often instruct patients to invest in one after prosthodontic treatment has been completed in order to prevent destruction of newly placed restorations. A guard may also be a tool used to alleviate muscle or joint pains for patients that are symptomatic. Another reason a mouth guard may be recommended is to prevent injuries to your mouth and teeth during sports or other recreational activities. An exciting moment for us San Francisco dentists is when our patients ask us to make a guard with the colors of their favorite sports team. It is important to maintain and clean your guard or appliance routinely as buildup and odor can cause it to become unhealthy or uncomfortable. When we fabricate the guard for you, we will instruct you if there are any special care instructions depending on the material it is made of. – Do not leave your guard in napkins or tissue. Always place it in the proper case when it is not in your mouth otherwise it gets thrown away easily. – Keep guards away from pets and animals, as they love making your mouth guard a toy and it will easily be a doggy chew or hockey puck. – Bring your guard with you to your dental checkups and appointments as we would like to check the fit and adjust it accordingly.